Love is in the air this week on Fanboys! -Sudbury's won 8 in a row. CAN THEY BE STOPPED? Then it's off to Flint as Steve talks to Firebirds associate coach Darcy Findlay about his time with the club about what it takes coaching a rebuilding club. This week Steve chats with the General Manager of the Saginaw Spirit Dave Drinkill as the team prepares for a hopefull long awaited deep playoff run for mid Michigan. Meanwhile Steve had an...odd experience in Kingston this weekend, the Petes and Gens rivalry kicked back up a notch, and the top four in each conference seems to be separating themselves from the pack. -if 3rd place Saginaw and 5th place Owen Sound fired their coaches, what's your team's excuse? -who fires a coach in February? -plus Brian's home renovation tips! Then we talk to RogersTV London's Alain Quevillon about London stuff as part of our 200 hours of community service. This week Brian takes over the interview duties as he chats with Emma Holmes from the Sarnia Sting as we get an insight on how teams run their social media and game day operations. Meanwhile the guys discuss the upcoming new arena in Peterborough, the arena problems in Hamilton and Michael DiPietro setting the new league shutout record. -did the WWE tip the hand of a possible CHL Network? Then Steve sits down with another big trade deadline winner, IceDogs General Manager Joey Burke to discuss the trade deadline and how Niagara can compete for a spot in Halifax. To say the trades leading up to the 2019 deadline have been crazy is an understatement. Keith Dotson from OHL Pucks & Stripes joins Steve to discuss the long list of trades from this past week. Steve just might have an opinion on the Guelph Storm trades that have already gone down and one big one that may be yet to come. MERRY CHRISTMAS YOU WONDERFUL OLD BUILDING AND LOAN! The boys celebrate their upcoming week off from the show by not talking about awful things for one week! Plus the usual 8 bit tunes and musical interludes! A wonderfully Merry Christmas to all our listeners, and we'll see you in 2019! -more fallout from Sarnia '03! Will there be a coaching vacancy in Junior C? -does Ottawa's point streak still count if they lost to a Q team? -who's dumb enough to buy a seat in the ends during Teddy Bear Toss? Then, to pour salt in Brian's open wound, Steve sits down with Ottawa 67's general manger James Boyd to discuss his career and of course, a 63rd straight week discussing the DiPietro trade. What started as a eulogy for a friend turned into The Michael DiPietro show, as Brian and his dad debate whether the Spitfires got fair market value for the face of the team. This week Steve chats with former Oshawa Generals captain turned scout for the Kingston Frontenacs Brent Gauvreau about his playing career and scouting in todays OHL. 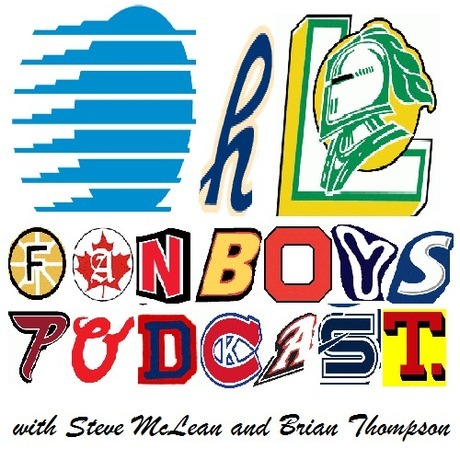 Meanwhile Kevin Jordan joins the boys to discuss a ton of topics this week including hazing, the provincial government endorsing the league and the closing of the GM plant in Oshawa and how that effects Gens fans.